"Grab the Free CAD Viewer from Autodesk." 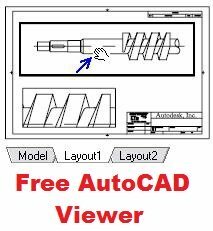 So you don't have the AutoCAD program but you need a good free AutoCAD viewer? If you've been looking for a drawing reader, you've come to the right place for the key benefits and a link to download the program. There's a great AutoCAD reader available at no charge from Autodesk (yes, that’s right it’s actually from Autodesk and not third party software). Even though it’s quite a large download (100 MB), it's well worth it. It feels just like AutoCAD, but without the ability to EDIT or DRAW. If you don't have the full blown or lite version of AutoCAD, this DWG viewer (DWG is short for "drawing") will enable you to view just about any version of 2-dimensional or 3-dimensional AutoCAD drawing. If you are viewing a 3D drawing, this free CAD viewer also includes the 3D orbit tool, same as in the AutoCAD program. It can also view DXF files (document exchange format), if needed, and publish to DWF format (design web format) if required. In addition, you have the ability to ZOOM and PAN, freeze and thaw LAYERS, shade wire-frames, and plot from model space or paper space; again just like the real McCoy. And here’s one I love; if you need to view drawings that were created by Architectural Desktop, the ADT Object Enablers are included with DWG TrueView™. No additional files to download and install (as you had to with pre AutoCAD 2006 versions). This AutoCAD viewer is highly recommended for those looking to share and review drawings, make paper plots, and publish to DWF format. Be sure to check the system requirements before downloading the program as you’ll need 300 MB hard drive space to accommodate the DWG viewer. You can download the free AutoCAD viewer here. (A new window will open for the above link. The system requirements link is in the top left corner of that page).